Jhajhidam or Bladderwort (utricularia flexuosa, family: lentibulariaceae) is a submerged and rootless herb with slender stem and branches. The aquatic plant is carnivorous It is is piled down slightly below the water. Leaves are composite, slender or linear, light green in color. Each node of the leaf has small bladder which catch the insects. 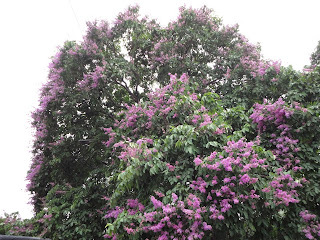 Flowering occurs in the rainy season to late autumn. At this time the flowers are seen standing on the water. Each upright stalk contains 1-7 flowers, yellow-colored, showy, petioled, petals 2, upper lip is smaller than the lower one. Stamens 2-4, bulbed. Fruits are round, capsule. The propagation of the water weed is caused by seeds and stem. The water weed is found in the beel-jhil, canal and waterlogged areas in Bangladesh. The plant is also known as Pani saibol.